Internet as information democracy, or new media news monopolies? There was a dream that the internet would mean the end of the media gatekeeper; that anyone could get their message out without having to get the attention and approval of the media powers that be. This turns out to be not quite the case. Organizations such as CNN, Fox, the New York Times and USA Today rank in the top 20. 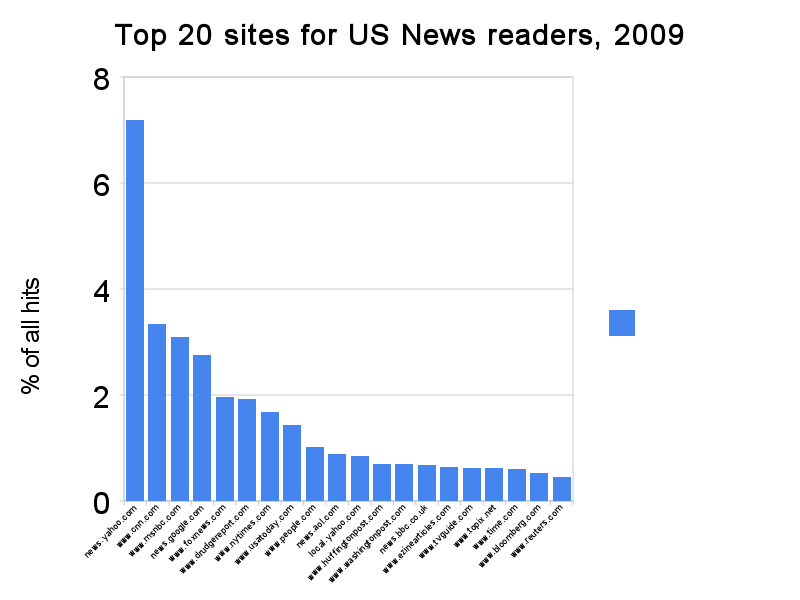 But so do new media giants AOL, Google News, The Huffington Post and Yahoo.com, which is the biggest news site of all. For better or worse, the ability to publish anything nearly for free hasn’t meant the end of big media monopolies. It’s simply shifted the landscape and the power balance. The limiting factor to getting your message out is no longer having access to an expensive printing press or a TV station. It’s attention: how many minutes of time can you get from how many people? In this game, brand still matters hugely. There are only so many URLs a person can remember, only so many sites they can check in a day. You have an audience, or you don’t. Mindshare is now the barrier to entry in the media world. Perhaps it always was, though I daresay it was easier to get viewers to check out your new television network when there were only 13 channels. Online, the number of channels is infinite for all intents and purposes; a single person will never exhaust them all. Which is not to say that the internet has changed nothing. We have seen over and over that bottom-up effects can propel something to mass attention, with no big company behind them. This is often called “going viral,” but that’s not quite a broad enough description of the effect. In many cases, what happens is that something becomes just popular enough to get picked up by mainstream media, who then propel it into the spotlight. 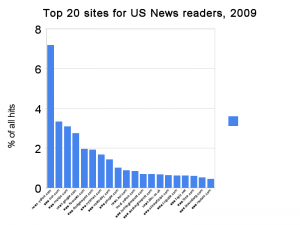 And what this PEJ top 20 list doesn’t take into account is that people now get online news from lots and lots of sources other than news websites. So has the internet made it easier to get non-mainstream messages out? I think the answer can only be yes. But don’t expect that anyone will be reading your alternative narratives just because you’ve put them online. Your best bet to to be heard still lies with a small number of very large companies. And although the internet per se is relatively uncensored in many countries, commercial gatekeepers like Apple and Facebook own important dedicated channels, and both of them engage in censorship (1, 2). I can easily share my personal exxperience and feelings online. Please let me know if you have any recommendations oor tips for brand new aspiring blog owners.